I am currently between houses – but I’m not unhappy about this state of affairs as I have the privilege of staying in a little cabin owned by friends. I have enjoyed the (KonMari style) downscaling … but the cabin is also in the midst of fabulous Rhododendron gardens (more on the gardens’ genesis and the original plant-hunting owners in future posts). Not only do I wake to a multi-coloured vista of maples, copper beaches and other rare trees, I walk twice daily in the grounds to make ‘discoveries’. This week has turned up one species I have particularly enjoyed researching and photographing. I am enriched by the opportunity to extend my knowledge base and to see plants in flower that are somewhat rare in modern gardens. The short, lemon-flowered Roscoea cautleyoides pushed its way slowly through a ground-tangle of Clematis montana, and I have been watching its progress since. The flowers (which can also be purple or white on the one stem in this species) hold themselves stiffly above the leaves and I was certain it was related to the gingers; surely enough, Roscoea is a small genus of the Zingeriberaceae family. Flora of China notes about 18 species in Bhutan, China, India, Kashmir, Myanmar, Nepal, Sikkim and Vietnam, with 13 species (eight endemic) in China. This species is found in the provinces of Sichuan and Yunnan, and would have been collected there by the gardens’ original owners. James Edward Smith, the English botanist and founder of the Linnean Society, named the genus in honour of his friend William Roscoe. Although a well-known politician, poet, historian and botanist, Roscoe fell out of favour with many local merchants for opposing the slave trade, the main source of Liverpool’s prosperity at the time. His father, an innkeeper and a market gardener, inspired in him a lifelong interest in gardening and botany. This interest led him to later establish the Liverpool Botanic Garden. Now known as Wavertree Botanic Gardens, it is a prime example of a mid-19th century public park, and incorporates Roscoe’s earlier walled botanic garden, relocated from land near Mount Pleasant in the 1830s. The French botanist François Gagnepain (noted for his geo-botanical work in Indochina and southeast Asia) named this species in 1901, and the epithet was originally spelt cautleoides due to the similarity of this species (and in particular the yellow colour of the flowers) to what Gagnepain knew as the genus Cautlea, also in the Zingiberaceae family. The spelling Cautlea is inaccurate: James Edward Smith had named Cautleya in honour of the English engineer and palaeontologist Sir Proby Thomas Cautley, who was responsible for devising and then supervising the construction of the Ganges canal during the East India rule in India (whilst also collecting fossils). William Roscoe, clearly a busy but fulfilled man, gathered exotic plants from all over the world and assisted in their identification and classification. His botanical work Monandrian Plants and the Order Scitamineae (published 1824 to 1828) drew chiefly from living specimens in his botanic garden at Liverpool, and was arranged according to the Linnaean system. Roscoea forms a pseudostem (a tightly wrapped cone of leaves) and, whilst bulb-like in appearance, the plant is an herbaceous perennial. The flower is orchid-shaped, with one large descending petal and several smaller petals above and beside the main petal. The remaining structures are four, sterile, petal-like staminodes. The lower two are fused together to form a lip on which pollinating insects land. The stamen has an anther with two pollen sacs, at the base of which is two spurs. Pollinators put pressure on these and make the stamen bend, thereby depositing pollen and touching the stigma on their backs. The plant dies back each year to a short vertical rhizome, to which are attached tuberous roots. 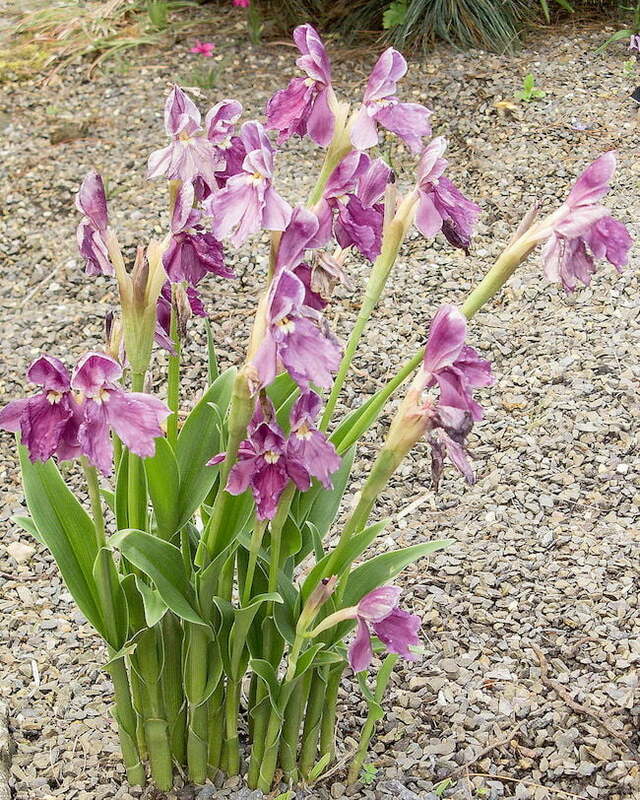 In order to flourish, Roscoea cautleyoides prefers partial to full shade and good summer watering, in pots or the ground (preferably a rockery). This species is regarded as easy to grow where there are long hot dry summers and winters down to -9 °C, as long as the plants are well watered (in the summer) and protected from the sun. Leaf spikes appear in early summer, by which time they have cleverly evaded the spring frosts, and flowers push through soon after. 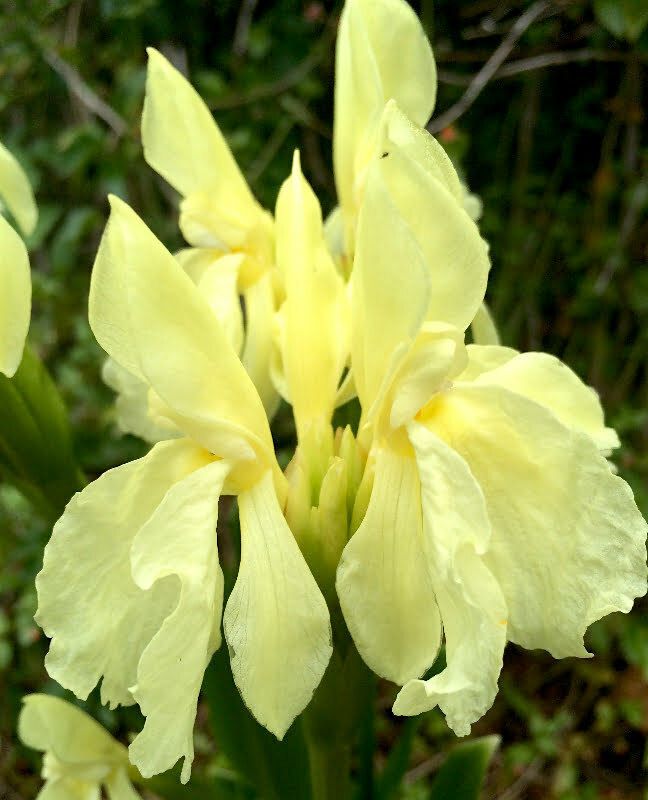 Roscoea cautleyoides is regarded as a robust form, and ‘one of the more commonly grown species’. 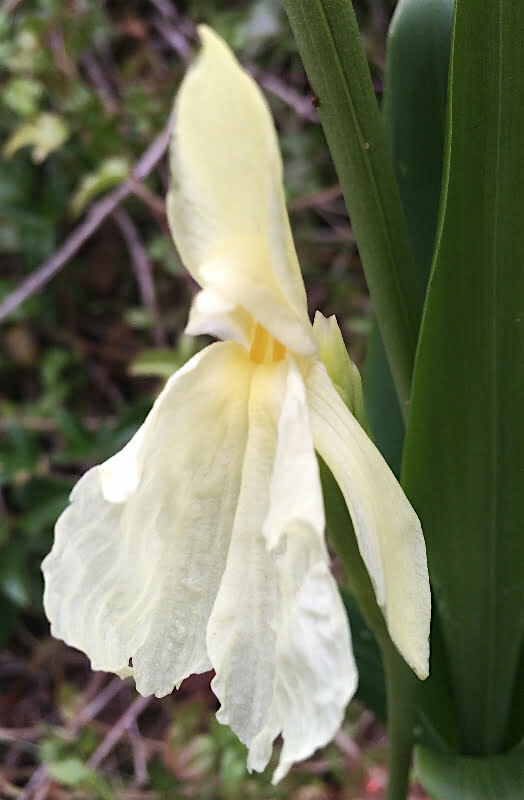 That said, I found it exotic and fascinating, and it cast a soft, pretty, lemony glow in a dark corner of the gardens.